So today I was trying to come up with dinner ideas using limited supplies. I hadn’t been shopping in a while, definitely didn’t have the time or motivation to make a trip out, and there weren’t really any protein options lying around that my kids would be too keen on eating. Lately I’ve been trying to save money on my food budget, which means being creative with legumes as a source of protein. But let’s face it, there’s only so much tempeh, black beans and kidney beans a person wants to eat, even if they’re made with good seasonings and veggies. 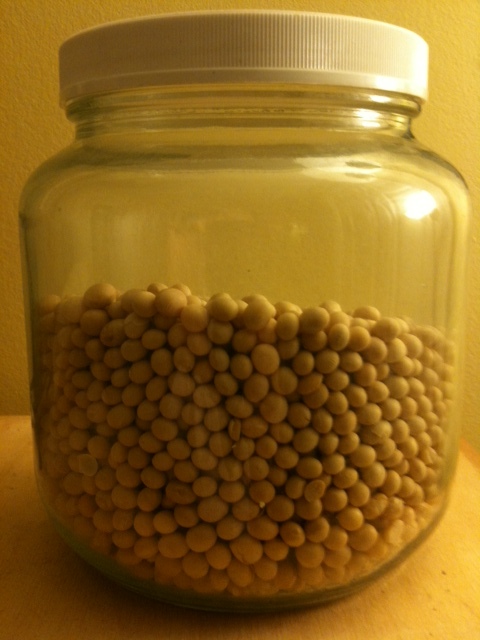 I happened to have some extra dried soybeans lying around, which I was thinking would probably never get used. (A few months ago I got really brave and attempted to make soy milk from scratch. It came out ok, but not something I’m really motivated to keep making, especially as I don’t want to consume tons of soy.) But tonight, I came up with an excellent plan for the rejected soybeans. I know, I know, soy gets a bad rap. But pre-soaked, drained, boiled, and eaten occasionally like any other bean isn’t something I’m worried about. And soybeans are super cheap, even the organic ones… so… here’s a really yummy recipe for you to try on a limited budget. In a food processor combine all the veggies, onions and garlic and finely chop them up (feel free to substitute whatever veggies you have on hand). Pour them into a mixing bowl. Next add the soybeans to your food processor (they will be more than 1 cup after cooking as they expand to at least 2x their original size) and blend them until smooth. Add them into the mixing bowl with the veggies. Next pour in the bread crumbs and seasonings, mixing well. Shape into patties and fry in olive oil on medium heat until golden brown and crispy on both sides. Serve hot and enjoy! This recipe makes about 16 burgers. I’m looking forward to eating the leftovers for lunch!